If there’s one tool that can unite us all, from the weekend gardener to the horror movie star, it’s the chainsaw. Thanks to advancements in technology and a push to make our lives more environmentally friendly, the electric chainsaw was invented as a new and exciting way to get the best out of this famous power tool without any of the negatives. For those in the market for a new chainsaw, you’ve likely realized just how complicated it can be to make your way through the different types and specifications that come with these machines. Although less complex than their gas-powered counterparts, there are still a few different bits and pieces you should know about your chainsaw. Owning an electric chainsaw gives you greater freedom to get your yard and garden clean, as it’s far more powerful than what you can achieve by hand. However, you need to be prepared to put in maintenance to keep it running at its best, and always take precaution when operating to ensure you’re not putting yourself or others in danger. Whether you own a mini electric chainsaw or something more powerful, there’s no doubt you can get ample use out of these amazing machines. The reason these are the most popular power tool in America is due to the versatility of what it can achieve, and how easy they are to use. The first chainsaw is believed to have been invented way back in 1785 and originally had a background in medicine. This first variety was used to remove diseased bone with its finely serrated edge, which forms quite a contrast to how we use them today. 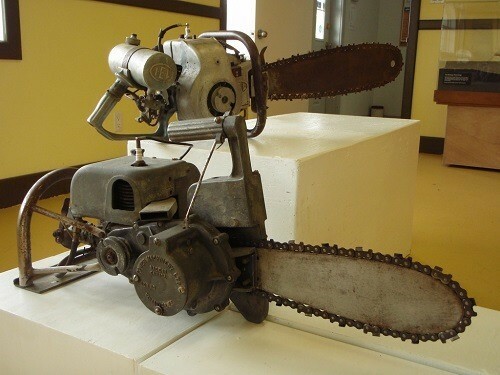 In 1926, the first gas powered chainsaw was patented and it began its use as we know it in this modern age. However, they were extremely heavy and large, and even took two men to operate. Around 1945, the first chainsaw was invented that could be used by just one person and they began to take the shape we know today. During the 1970s, many of the chainsaws released on the public market started to feature automatic functions and were engineered to be safer than ever. Functions such as self-cleaning, automatic oil lubrication, and self-sharpening were now available for home chainsaws and made ownership easier than even. Since then, electric chainsaws have become increasingly popular as they’re now more powerful than ever but with a whole range of benefits over gas varieties. As this device advances even further, it’s likely that we’ll see more small electric chainsaw models which offer compactness and power in the one package. Both electric and gas powered chainsaws work in similar ways, with the main difference being how their motors are powered. The chainsaw is made up of a chain that has teeth or cutting edges running along it. When the chainsaw turns on, this chain rotates around and the small teeth slice a piece of wood each at a time, eventually cutting through the entire object by working together. When you use a sharp chainsaw, you’ll notice that it produces chips of wood rather than fine sawdust. This fine sawdust is usually only found with power saws or those with smaller teeth, whereas the chainsaw creates these larger chunks of wood. Chainsaws are ideal for cutting wood mainly, but there are plenty of smaller jobs that come into this category. They’re ideal for people who enjoy gardening or who have quite a lot of yard to work with as they can trim branches, clear brush, and even saw larger trunks in half. An electric chainsaw is ideal for the home operator as you’re generally using them in a static location, so it’s okay if you need to be close to a power supply. Gas powered chainsaws are reserved for commercial use such as professional lumberjacks as they’re capable of working with large pieces of wood and with greater power. Ever since the electric chainsaw was invented, there has been heated debate among all kinds of woodcutters as to which is best. While it’s true that they have their own benefits separate to the other, the electric chainsaw always seems to come out on top. When you consider the difference between regular and electric chainsaw, the benefits of the electric always reign supreme. One of the biggest benefits of owning and operating an electric chainsaw is just how quiet they can be. If you’ve used a gas powered chainsaw before you realize they’re extremely noisy and can irritate the user and those around them. If you plan on working around the home or areas where you should keep noise to a minimum, this is a huge advantage that the electric chainsaw offers. Gas powered chainsaws not only create a lot of smoke and fumes when you operate them, which can be damaging to your health, but they’re responsible for a lot of damage to the environment too. A study found that gas chainsaws and electric trimmers were more harmful to the road workers than the passing traffic that they encountered, and this damage is felt by the user and the environment. When you ditch the motor in a gas chainsaw, you get the benefit of a far more compact and easier to maintain machine. Although you sacrifice some power without this motor, the advancements being made in electric chainsaws are hoping to change that eventually. Not only is it cheaper to buy an electric chainsaw but it’s cheaper to run, as there’s no need for maintenance or constantly filling the gas tank. These models usually start at $50 and go upwards depending on how many bells and whistles you want. If you’ve ever handled a gas powered chainsaw before you’ll know how heavy they can be, and the vibration that comes when you turn them on is enough to give you hand cramps almost instantly. An electric chainsaw is quiet with no vibration, and they’re extremely lightweight too. This makes these models perfect for the elderly, people with injuries, or anyone who’s never handled a power tool before. When it comes to electric chainsaws, there are two types you need to consider. Each offers their own advantages, though, so it really depends on what type of cutting you’ll use it for and what the operator needs from their power tools. Whichever the choice, though, you can feel happy knowing that they can run on clean, renewable energy to operate and cost considerably less than their gas-powered counterparts. The corded electric chainsaw features a cord which plugs into an electrical socket and uses power to operate. Although you’re limited as to where you can take it, you’ll find these far more powerful than a battery operated saw could ever be. 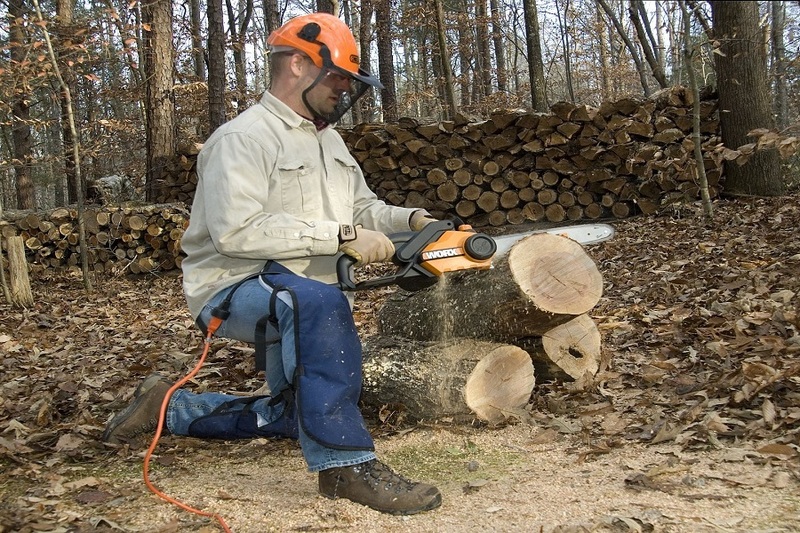 If you’re hoping to perform larger cuts and bigger jobs, the corded chainsaw is ideal. Another huge advantage to the corded electrical chainsaw is its staying power. When plugged in, there’s no limit to how long you can work with it and you won’t have to keep coming inside to recharge the battery. If the cord isn’t long enough on your model, it’s easy enough to attach an extension lead to give you a greater range of motion. These corded chainsaws are usually cheaper to purchase as well, as they don’t include the battery pack or charging station. If you’re looking for something powerful and don’t need to take it too far, the corded variety is a great choice. A cordless electric chainsaw is one that runs on batteries, so there’s no need to have a power supply nearby to operate them. The main benefit with this is that you’re given more freedom to where you can use it. If you don’t have a power outlet situated outside or you don’t want an extension cord creating a potential hazard, the battery operated cordless chainsaw is a great option. Another advantage to the cordless electric chainsaw is their weight and size, as these usually come a lot more compact than a corded model does. This means you can use them for longer periods of time without becoming fatigued and they’re great for people who might not have as much strength as they’d like to operate a power tool. The lightweight feel makes them easier to control so they can be particularly useful when performing tricky cuts as well. Just like any power tool, there are many different bits and pieces that contribute to the device. The electric chainsaw is the same, with a few parts that are important to learn if you plan on purchasing one of these devices. This is the actual chain on the machine that is used to cut through wood. The saw chain features lots of small, serrated teeth that make up the entire chain. When purchasing a new chainsaw you’ll notice it explains the length of this saw in inches so you can determine what size it is. The guide bar of a chainsaw is a long and rounded object made from metal. An edge slot situated on the outside of the bar guides the chainsaw’s cutting chain and holds it in a safe and secure position. When using the guide bar, you hold this against the object you wish to cut for greater control. Depending on the type of electric chainsaw you use, each will have a different power source. Corded chainsaws will plug directly into a wall socket, where a cordless chainsaw will feature a battery pack and external charging system. Although not as necessary when using a small chainsaw powered by electricity, there is some degree of noise control on all of these tools. Gas powered chainsaws especially can be quite noisy, so there’s usually a muffler included to bring the volume down somewhat. As using a chainsaw can be quite risky, manufacturers must implement a number of features to ensure the safety of the user. The chain catcher is the most important of these and is usually made from metal or plastic. This guards the chain should anything happen and will prevent it from flying in the face of the user. We now know just how many advantages the electric chainsaw has over a gas powered one, but what are the benefits you can get from owning a chainsaw altogether? These devices aren’t just good for cutting down branches, and there are plenty of ways you can benefit from this simple investment. The most obvious benefit to owning a chainsaw is that you can keep your yard and garden tidy. Whether you’re looking to sell your property and want to keep it maintained for potential buyers or just like the look of a freshly cut garden, this is one tool you can’t go without. For those who have kids especially, you’ll know just how many dangers can be lurking in an overgrown garden. Spending half an hour each weekend trimming back sharp branches or overgrown bushes can make your garden from child-friendly and safer for everyone to enjoy. If you live in colder climates and rely on your fire to keep you warm, you probably don’t want to spend money each week or purchasing firewood. With your own electric chainsaw, you can chop down your own wood for the fire and save yourself money. Whether you’re doing odd jobs around the home or cleaning up your garden, it can become expensive to constantly hire tools from your local hardware store. Just one small investment in an electric chainsaw can save you loads over its lifetime, and since there are no running costs like a gas model, you can save even more. For those who spend a lot of time in the garden using a variety of tools, you’ll be surprised how much of this time you can save when you swap them for something electric. Rather than sawing or pruning by hand, a chainsaw can make light work of branches and shrubs so you can have more time to spend relaxing. One of the best things about owning an electric chainsaw is just how easy they are to use, so they suit everyone from casual lumberjacks to absolute amateurs who’ve never handled a power tool in their life. 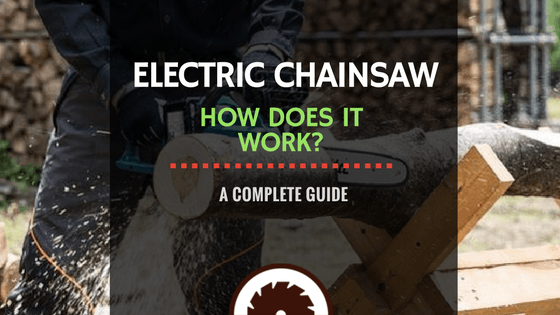 Depending on the model you own, there might be a different way to operate your chainsaw, but these steps should generally cover you for most electric chainsaws. 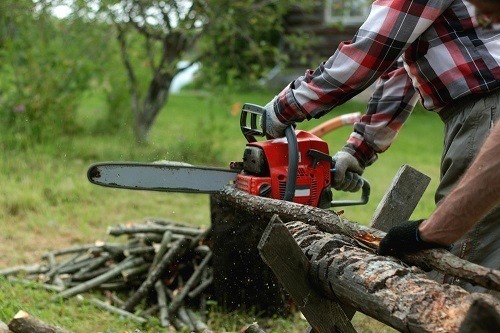 Always operate your chainsaw in a safe place and not under the influence of drugs or alcohol. Check for water near your cord, dangerous weather conditions, and anything else that might cause a hazard. Ensure you’re wearing personal protective equipment as well. Fill the saw’s oil reservoir with oil, being sure to note the owner’s manual in case there is a recommendation about which type to use. Some chainsaws have automatic oiling, so all you need to do is ensure this is full. Plug the cord in of your chainsaw into the nearest and safest power cord. If required, install an extension lead before plugging it in and turn on the socket. Point the chainsaw’s blade away from your body and not near anyone else, and then turn it on by engaging the safety switch and then pull the chainsaw’s trigger. Wait for the chainsaw to lubricate its chain and give it a few moments before operating. Bring the saw to the tree or piece of wood with the middle of the chain, never beginning a cut with the tip. Apply slight downward pressure at times but never force the chainsaw to cut as they will do this on their own, and it can be extremely dangerous. Once you’ve completed the job, be sure to clear away and debris and allow your chainsaw to cool down completely before storing it away. Safety is always the most important thing to remember with a chainsaw, as one wrong move could cause serious injury to the user or others. Always wear protective gear and keep the saw pointed away from people, and employ common sense at all times when operating. 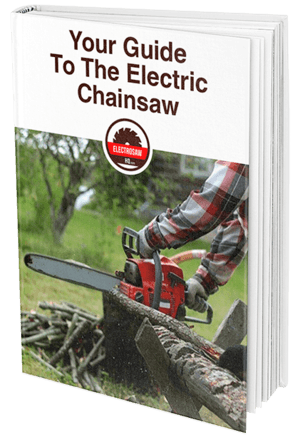 Along with knowing how to operate your electric chainsaw, there are a few things you should be doing to provide care and maintenance. With a little bit of effort on your part, you can ensure that your chainsaw lasts for many years and is less prone to mechanical failures. A clean chainsaw is also less likely to cause damage, as parts of wood and dirt can become stuck in the teeth and sometimes cause injury for the user too. Most importantly, the chain blade should be regularly cleaned. This blade is automatically lubricated as the chainsaw operates, and the oil reservoir which dispenses this electric chainsaw oil can become easily clogged over time. Ensure that you focus on this area when cleaning the blade as insufficient lubrication can damage your chainsaw and pose a threat to your safety. Wipe down the bar regularly to remove oil and other pieces of debris and check the cutters to ensure there isn’t any wood clogged in between them. Remove the armature or motor cover to see that not dust or debris has reached inside, and if needed give it a wiping down also. If they’re stubborn, you can use compressed air to get them out safely. If you don’t have an electric chainsaw sharpener function on your power tool, you can easily sharpen the blades yourself. This requires some extra attention as you’ll need to fill each individual tooth using a specially made chainsaw file. A blunt chainsaw can be dangerous and infective, so this is an important step to maintaining the life of your tool. Finally, give the body just as much attention and wipe it down to remove oil and dust from the exterior. It’s just as important to have this clean and tidy as you don’t want to slip while working and lose control of the saw. Be sure to store your chainsaw somewhere safe and free from harmful elements when not in use, and your care and attention will be rewarded with a longer lasting power tool. Every home in America has likely had a chainsaw at some time or another, and with this new range of electric power tools, the chainsaw is set to become an even popular choice for home gardeners and handymen. There isn’t much that you can’t achieve with a chainsaw, and it’s really the only power tool you need to help you tackle tough yard work. Electric chainsaws are full of advantages over the regular gas powered kinds, and not only will the environment be thankful you made the switch, but you’ll find it easier, quieter, and less messy to operate. These chainsaws are ideal for a whole range of users, even if you’ve never handled one before, but they can be serious enough to please the professional lumberjack too. As more and more of our home power tools make the switch to these corded electric varieties, the advancements we see in their convenience and ease of use will only get better. If you had to choose one serious product to save you time and energy around the home, it has to be an electric chainsaw.